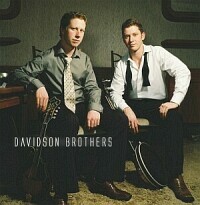 The Davidson Brothers self titled album has been nominated for an Air Award (Australian Independent Record Labels Association Awards) for Best Australian Independent Country Album. The awards started in 2006 in Sydney and they provide recognition of outstanding achievements by 100% Australian independent artists – specifically those artists who are released through an Australian owned independent record label and also distributed through an Australian owned distribution company. Joining them in the Country Album category this year are the Noll Brothers, The Flood, Felicity Urquhart & Bec Willis. The finalists are selected based on their overall performance in the charts over a 12 month period from 1st Sep 2007 to 31st Aug 2008. The 2008 Jagermeister Air awards winners will be announced in Melbourne at the Corner Hotel on 24th Nov. Early in October, Lachlan Davidson arrived home after traveling to Nashville for the IBMA World of Bluegrass International Summit. The meeting covered topics on building the awareness of non-US bluegrass bands, developing world-wide intercommunication within the bluegrass population and developing an International committee. ‘The trip was very extremely valuable‘ described Lachlan, with the great connections he made and tools learned at the Trade show. During the visit he met Vince Gill & Dan Tyminski, attended the 2008 IBMA Awards show and did plenty of jamming. Just last week, the boys played to a sell-out crowd at their show in Bendigo (Hamish’s new home town) and opened to a full house for the McClymonts. Long Distance Love Affair is at Number 11 on the Country Music Channel this week. The radio single peaked at 26 on the Country Tracks Chart in September and the video is now entering it’s 7th week on CMC’s top 30. Thanks to everyone that has voted for us and keep up the great support. Note – You do not have to have austar or foxtel to request. 4. Hit the REQUEST link at the top left. 3. Hit the REQUEST link at the top left.